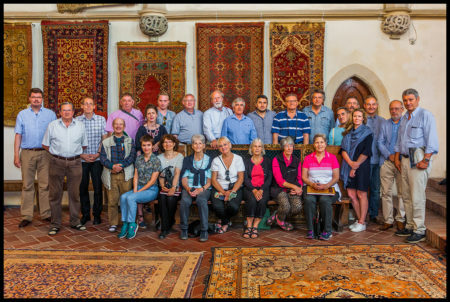 In the style of the past tours, we will meet museum curators, reputable dealers, carpet collectors and people who love sharing their knowledge. Food, wine (where possible) and accommodation have been carefully selected. The tour (except for Petra, in Jordan) does not involve walking for long distances. Download the Program and the Flyer. After the 100th anniversary of the great Budapest exhibition of 1914, when the ‘Transylvanian’ rugs were brought to the attention of the wider public, we had a fresh look at this fascinating and controversial group. According the design they can be divided in 4 main subgroups: Single- and Double-niche rugs (which should be discussed together), Plain-niche prayer rugs and Column rugs. These groups employ peculiar motifs for the borders and for the spandrels which suggest they were produced in different centres in Western Anatolia. The slide below shows the main groups of ‘Transylvanian’ rugs and their population world wide: about 720 examples survived today. The population of ‘Transylvanian’ rugs, divided by design groups. Today Transylvania is still the region with the higher number of such examples world-wide. 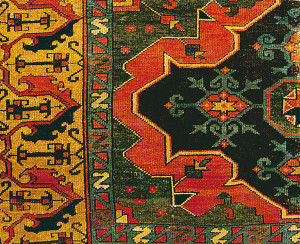 These rugs are all prayer format and reflect the technique of Western Anatolia weavings: wool on wool structure, lazy lines, weft color changes. In many cases we can observe stitched side finishings (which leave exposed weft). The absence of corner solution suggest the weavers did not follow a complete design. All the directional examples (except a couple of rugs) are woven upside-down which is a practical solution for making a well designed arcade. This is a relevant fact, which was somehow overlooked in the past. The upside-down technique is not encountered in Small Ushaks. 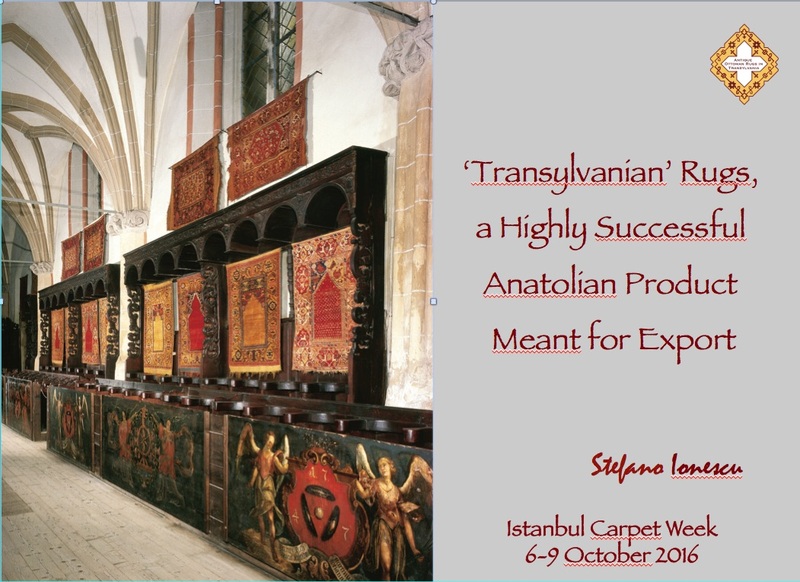 Together with the Lottos, the ‘Transylvanian’ rugs represent the largest surviving group of 17th century Anatolian carpets. 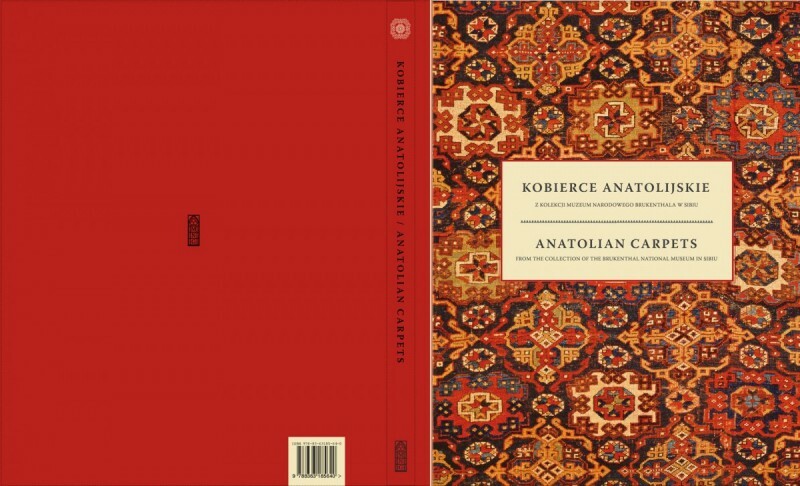 Studying this group is fundamental for understanding much of the 18th and 19th century rugs of Bergama, Demirci, Dazkırı, Gördes, Karapınar, Konya, Kula, Ladik, Milas, Mucur, and even beyond to eastern Anatolia. Download the brochure of the tour. 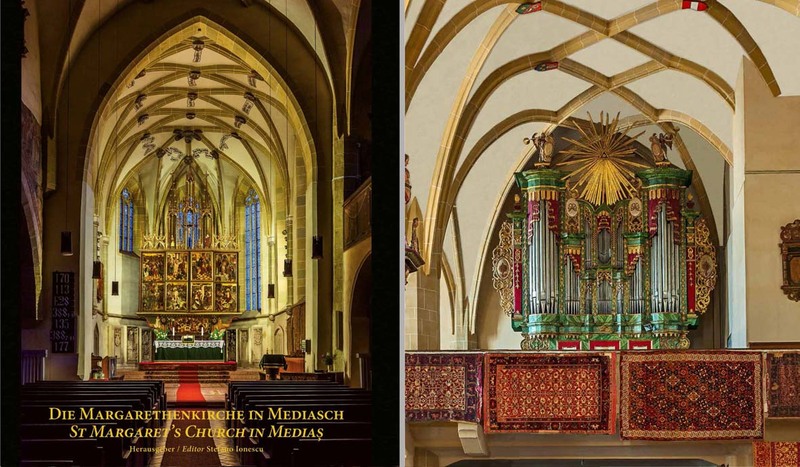 Dieses Buch ist eine Würdigung der Schönheit der Margarethenkirche und der mittelalterlichen Kunstschätze, die sie beherbergt, sowie der historischen anatolischen Teppiche, gespendet von Gemeindemitgliedern in vergangenen Jahrhunderten. Brochure. 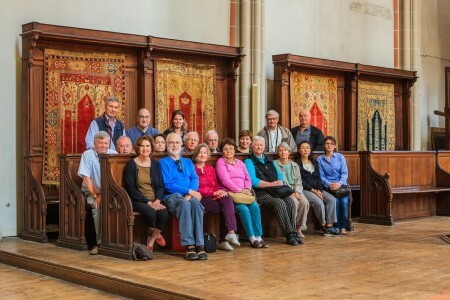 Every carpet enthusiast should come at least once to Transylvania… We have been running this tour since 2004 and hundreads of people enjoyed the journey to Romania above expectations… Here are some comments from participants of the past tours. This year we added an extra day (without increasing the cost of the tour) in order to enjoy the wonderful Saxon villages in Central Transylvania, with the fortified Churches included in the UNESCO heritage list. The presence of the Ottoman rugs in these churches is a fascinating culturual phenomenon. We also added some unique features like the presence of a talented photographer Eduard Baak from Brasov http://eduardbaak.ro, who will produce an album of the tour. See some of his photos below… Download the brochure of the tour. The tour starts with a program in Lombardia, focused on textiles. We will attend Sartirana Textile Show, organised by the Florentine scholar and dealer Alberto Boralevi, which is one of the most important carpet shows in Europe. 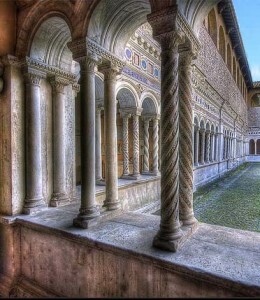 Then we will have a wonderful tour in Palermo with some absolute Arab-norman highlights followed by Naples and Amalfitan coast. At the end all the roads lead to Rome. 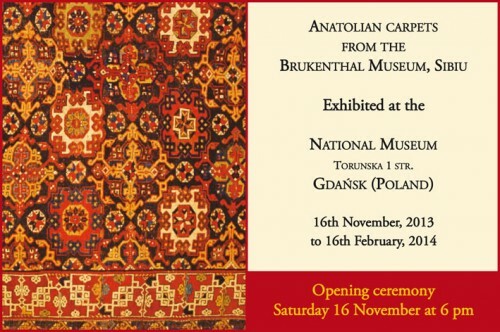 24 highly important Anatolian rugs from the Brukenthal Museum, Sibiu will be on display at the National Museum of Gdańsk from 16th November, 2013 to 16th February, 2014. It is the first time after Budapest 1914 that all the best examples (dating from early 16th to mid-18th century) of the leading museum in Transylvania will be again on display: ‘Holbein’, ‘Lotto’, white-ground Ushaks and a wealth of ‘Transylvanian’ rugs. The opening ceremony will be Saturday 16th November, 2013 at 6 pm. Sunday, 17th November at 11 there will be a guided visit of the exhibition followed by a lecture held by Stefano Ionescu. For those who love classical carpets I think is a “once in the century” event! Most probably the exhibition will increase the desire of rug enthusiasts to visit Transylvania ! Hope this will be a great start in connection with Budapest 2014! 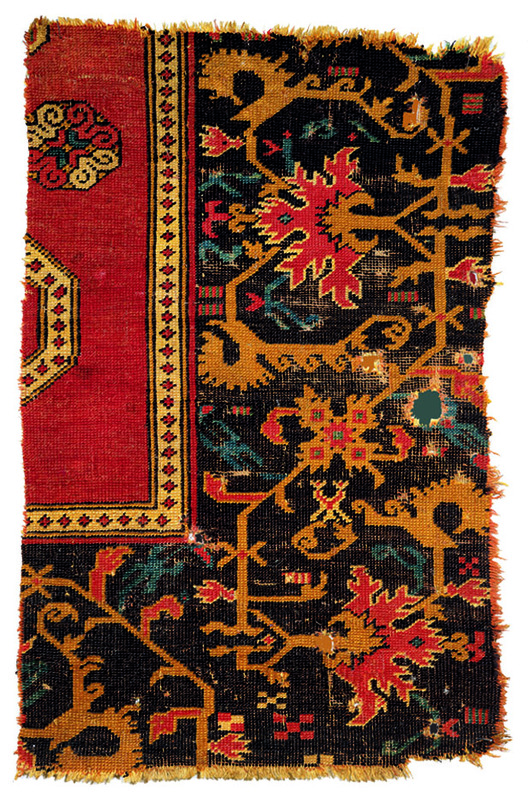 Transylvania continues to be the repository of the richest and best-preserved group of small format Turkish rugs outside the Islamic world: almost four hundred examples (including fragments) attributable to the golden period of Ottoman weaving. We will discuss how and from where the rugs arrived and why they entered the patrimony of the Protestant Churches and led to the ‘Transylvanian miracle’. 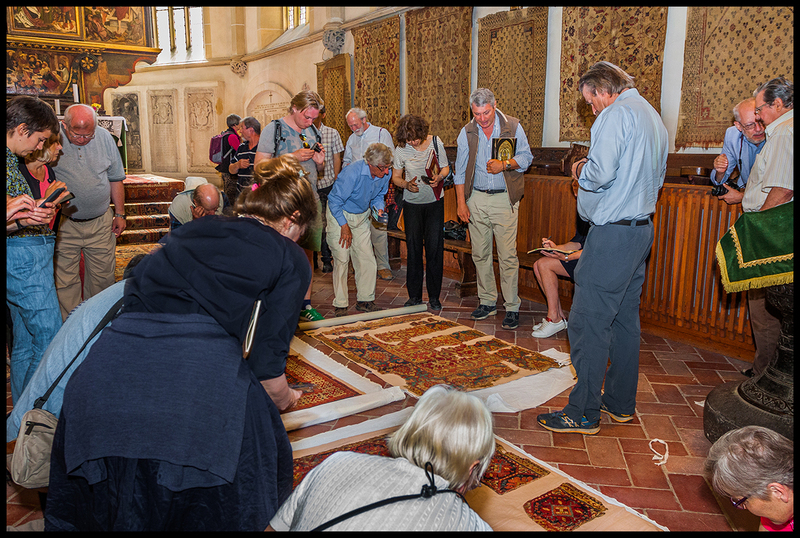 Then we will visit some Church collections with an eye to the best examples, ranging from the late 15th to early 17th centuries: Ushaks, Holbeins, Lottos, Selendis and a wealth of Transylvanian rugs. Entrance round the corner in Barter Street. Doors open from 6.0pm. Drinks and snacks are served. 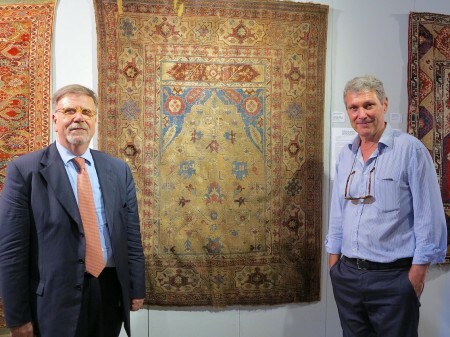 The passione collector and dealer Norbert Hauser, running Buhara carpet galleries in Bucharest and in Sibiu (Transylvania) will be exhibiting 19th century rugs from Anatolia, Caucasus and Romania in BERLIN Hektorstasse 9 / 10. The program takes advantage of Alberto Boralevi’s previous trips to the region and also from the cooperation with Dr. Roya Tagieva of the Carpet Museum in Baku. As usually on my tours we will see carpets and textiles, meet weavers and very nice people, visit some of the most significant places in the region. At the moment we have 15 participants from Europe and US and we plan to take 25 pax. Time to take a decision is very short. Participants who can spend more time will be assisted to visit other regions. Join a new carpet adventure! Download the program of the tour to Azerbaijan. The inaugural HALI Art and Culture Tour will take participants on a unique journey through a pristine landscape, visiting not only the repositories of grand carpets, but also first-rate folk-art museums, UNESCO World Heritage Sites, stunning medieval towns, Royal castles and more. Along the Silk Road: join a new adventure starting on April 19 in Tashkent: this is the best time to visit Samarkand, Bukhara; the tour will cover the main Islamic treasures of Uzbekistan avoiding long bus journeys. International textile oriented group, great hospitality, fusion food, all meals included. “Tim and I want to thank you so much for arranging yet another fabulous tour. We can’t tell you how much we appreciated all of your hard work on our St. Petersburg excursion! 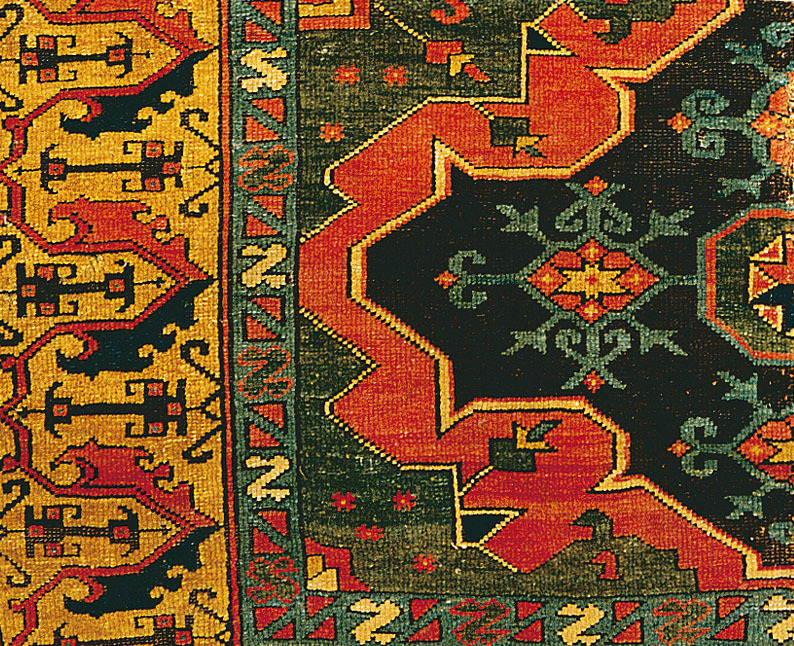 Dozens of Romanian folk kilims (scoartze) and almost 300 Ottoman rugs from late 15th to 18th century, in the Lutheran Churches and the Museums of the region, including examples in the store-rooms. Please contact Stefano Ionescu.